This Cluster Fly Treatment Pack has been carefully put together by our pest control experts to offer you the best combination of cluster fly killing products and enable you to eradicate a cluster fly infestation in your home or business. Each kit contains sufficient products to carry out several treatments to a standard roof space. This pack contains our best selection of products, including Pest Expert Formula ‘P’ Cluster Fly Smoke Bombs, powerful insecticidal fumigators to eradicate cluster fly colonies fast. This kit also includes the hard-hitting residual insecticides Formula ‘C’ Cluster Fly Spray and Formula ‘P’ Powder from Pest Expert, offering ongoing killing power for up to 12 weeks following the initial cluster fly treatment. 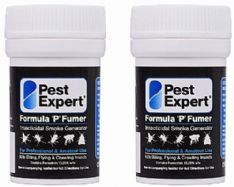 4 x Pest Expert Formula 'P' Smoke Bombs: Potent insecticidal smoke bombs designed to flush out cluster flies from lofts, roof spaces and other areas of your home or business. Once the touch paper has been light to smoulder they will release a permethrin smoke which in an enclosed area will kill all cluster flies present at the time of treatment upon contact. The smoke leaves no residue on any furnishings and will not taint of damage any of the room of its contents both during and after use. Fumers should be applied at a rate of one per 120 cubic metres, approx. one per room or one twin pack per standard loft space. 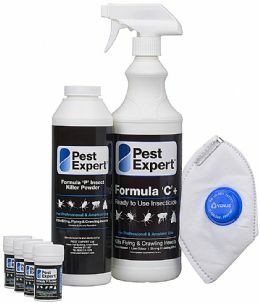 1 x 1 Litre Pest Expert Formula 'C' Cluster Fly Killer Spray: A highly-effective cypermethrin-based insecticide with residual value for both fast-acting and long-lasting cluster fly control for up to 12 weeks after initial application offering extended protection from cluster flies. For direct application to alighting surfaces, including roof beams and window frames. Formula ‘C’ is non-staining, solvent free, low-odour and completely invisible mang perfectly suitable for use in homes with children and/or pets. A 1ltr triggers spray will cover an area of approx. 20 sq m.
1 x Safety Mask and Gloves: For airway and skin protection whilst carrying out your cluster fly treatment.